I recently had a talk with a guy who claimed that he knew exactly what social media could do for companies. The funny thing is that he knew this without even using social media himself as he did not believe in this as a way to get his work done. His claim was based on lots of observations related to investment opportunities. I was a bit surprised by his position and claims. Even though I spend several hours a day using social media tools such as LinkedIn and Twitter, I do not have a clear-cut answer on how to extract value out of social media. I have gained some good insights, but I still consider myself to be in an experimentation phase and I have even acknowledged that I might be stuck in this phase forever considering the constant change in the social media landscape. Get your hands dirty: You can’t teach others – or even try to influence others – on the use of social media if you are not willing to get your hands dirty and play around with the tools and services yourself. It’s both personal and business: The person I spoke with did not want to mix his personal and professional identities in the virtual world. I can relate to this (Facebook is only for private matters for me), but I also believe that you get better results if you don’t separate too hard here. One key reason is that you are at risk at running short of the time and/or mental capacity needed to build strong social media platforms. This kind of effort is time consuming and requires persistence. I also think being personal and genuine can make your platforms stronger. Rather than separating completely, you need to find a balance even though you work in a corporate setting with team members and corporate accounts / identities. Looking for more information on the best social media tools? Browse our social media tools resource page for blog posts, product reviews and exclusive content. 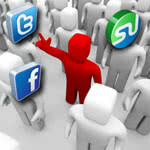 Or, download one of our free Top Social Tools reports to compare the leading social tools by pricing and key features.